WALLINGTON, NEW JERSEY used to be notorious for its bars. Well, perhaps notorious is too strong a word. They generally weren’t centers of gambling and prostitution. They were mostly blue-collar shot-and-a-beer places. But there were plenty of them, located on both the main drags and the back streets. Back during the Great Depression of the 1930’s, a lot of homeowners put an addition on the front of their houses and opened up a bar where the parlor would have been. Despite all the national unemployment, there were still many people working in the mills across the river in Passaic, and with all of the gloom, most of them could use a drink on the way home. So there was just enough demand for convenient liquor as to allow these homeowners to make a few coins. Back in the Depression, every little coin helped. Many of these little mom-and-pop bars held on into the 1960s and 1970s. A few would still open up now and then, into the 1990s. By 2000, though, just about all of these neighborhood places were gone. Not that Wallington has gone dry, but you now have to stick to the thoroughfares and find a bar with upscale pretensions, or maybe a place with a restaurant attached (or the bowling alley on Paterson Avenue). Interestingly, though, if you walk the back streets of old-town Wallington, you will notice all of the funny-looking houses with living rooms extending out to the sidewalk line; i.e., the remains of the old bars. Actually, there is one little tavern on Locust Avenue that is barely hanging on, but it’s in its last days. Locust Avenue is one of the main drags; however, the layout of this place is definitely classic Wallington-1930s, i.e. a shoebox in the front of an old two story house. The establishment in question had been run since the Depression by the Puzio family. Sometime during the late 70s or early 80s, one of the sons living at home decided to fix the place up a bit and keep regular evening hours on most weekdays and on Saturdays. It was no longer a dingy old bar smelling of spilled beer and rye, with a couple of old guys on metal stools burning cigarettes in the dark while watching a ball game on a TV above the cash register. “Pee Wee” (what everyone called the fellow who ran the place) built up a patronage of college students and young middle-class professionals during the 1980s. And I was one of those patrons. The “Colonial Room” (the place actually didn’t have a sign with that name, but there were printed matchbooks saying “Pee Wee’s Colonial Room”) was always a nice place to start the evening with. You’d leave by 10pm for other points of interest, for places where more exciting things may or may not have been happening. But even if the rest of the evening went bust, at least you got a nice hour or so in at Pee Wee’s. Pee Wee works a day job, and by the 1990s, he lost interest in being a barkeeper by night. The place wasn’t open as much, and then finally wasn’t open at all. The 21st Century arrived without a Colonial Room available to stop into for a beer and a quick chat with good old Pee Wee. The world had lost another good thing. But not totally, as it turned out. Last year, my brother told me that he had run into Pee Wee at his church, and even though the guy is now in his early 80’s, he said he would try to open the bar on Saturday nights – although he couldn’t promise that it would be every Saturday. Nonetheless, Pee Wee did make good-enough on his promise, and late last December I stopped in with my brother for a reunion. It was bittersweet. Pee Wee was now an old man; he’s still in pretty good shape for his age, but different from the guy I remembered (although he still has a good barkeeper’s knack for hospitality; e.g. he still gives you a glass with your beer bottle, without asking). The place was mostly empty and quiet. Pee Wee only had the background lights on, unlike the old days when all the lights were lit and the seats were full of people chatting and laughing. Behind the bar were just a few bottles, just enough to fix a couple of mixed drinks; quite unlike the rows of bottles on the shelves against the back wall, as in the old days. The reunion was great, but there was no doubt that it was 2007, and that the old magic wasn’t coming back. My brother and I got there again last week; things were about the same, but I wasn’t expecting much this time. In a way, the melancholy had lifted somewhat with oldies music playing in the background, and with another customer or two present. But a “new era” for the Colonial Room is not in the offing. Pee Wee told us that he and his wife now have the place up for sale, and hope to move out of state in a few months. So although we will hopefully get back there at least once more before the end, the focus must remain on the past, and not the future. The goodbye process has begun. But at least there will be a goodbye process. Too many good things pass without a decent goodbye. 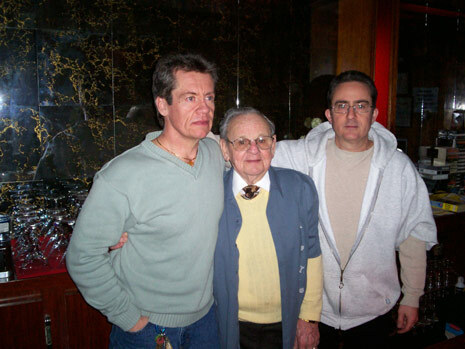 So here’s a pic of “the Wee” in his bar, with two friends. He’s obviously the guy in the center; Wallington is not good with irony, so you don’t expect a “Pee Wee” there to be a 7-footer, nor a “Big Moe” to be four-eight. Nonetheless, Pee Wee was a classic “tavern keeper”. The world will have lost something on the night when he locks the front door of the “Colonial Room” for the last time. What a very nice tribute to your friend Pee Wee AND to the pleasant and happy times you and your friends had in his bar. A good tribute to old times; yes, they are in the past. But very good that you have a chance to say good-bye.